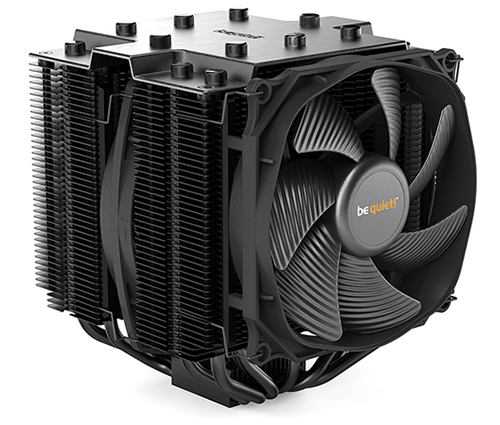 Our buying advice for a high-end CPU cooler is usually pretty straight forward. 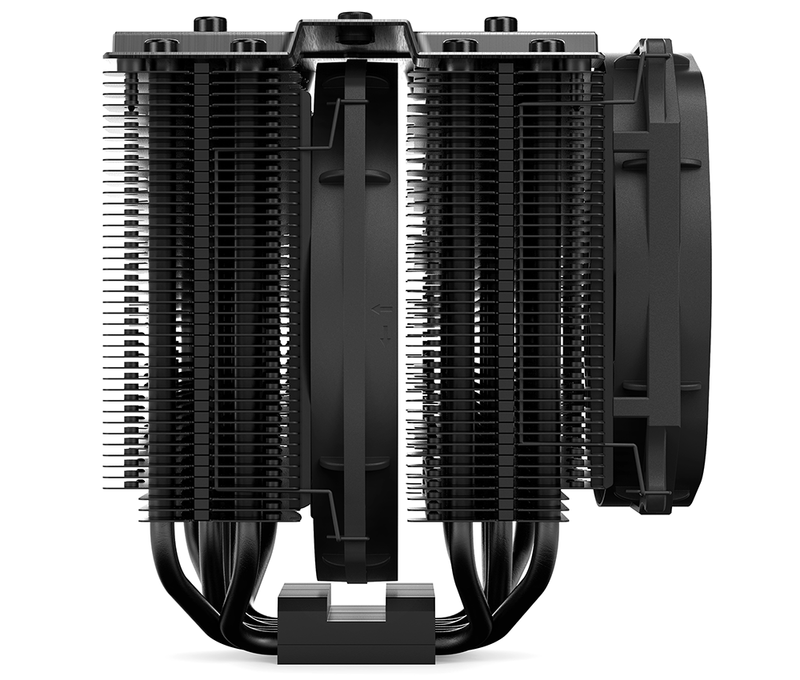 Those wanting to take the liquid route can choose from numerous all-in-one solutions that have plenty in common, while those who prefer an air cooler should probably choose a Noctua. That's the general line of thinking, but there is a caveat in that Noctua's beige-and-brown colour scheme isn't for everyone, so where do you turn if you need an ultra-high-end air cooler that performs admirably while also looking the part? The answer, it seems, is the be quiet! Dark Rock Pro 4. First unveiled at CES back in January, the Dark Rock Pro 4 is be quiet! 's latest attempt at a flagship air cooler and is making its way to retail shelves priced at £80 The fee is in line with our expectations of a premium solution in today's market - Noctua's rival NH-D15 carries the same price tag - but for those who favour something a little less extreme, a second-rung Dark Rock 4 offers a smaller profile and a single fan for a more palatable £65. HEXUS has had the opportunity to put Dark Rock Pro 4 through its paces and let's not beat around the bush; we've been left suitably impressed. 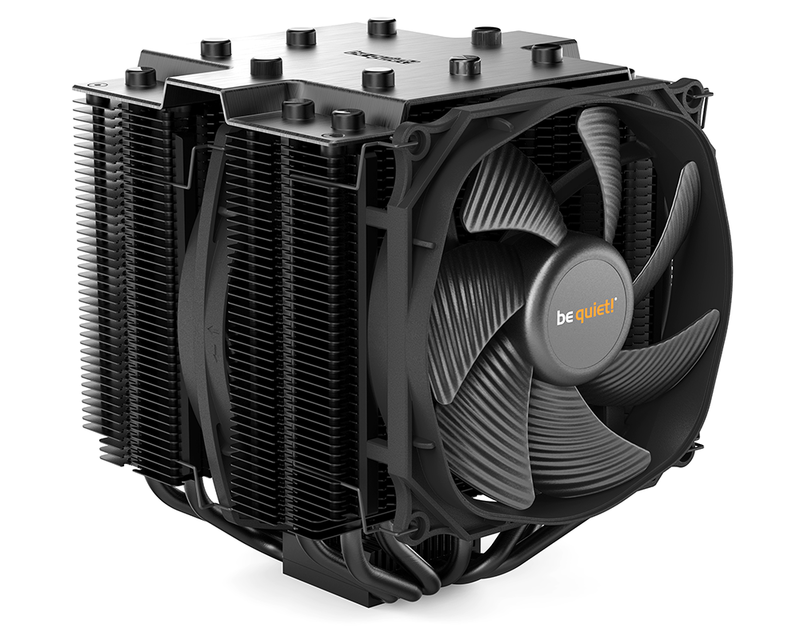 At first glance the cooler looks a lot like its 2014 predecessor, but that's no bad thing. be quiet! 's all-black aesthetic is easy on the eye and well suited to just about any build, while the brushed aluminium lid remains a stylish topping. There will be those who lament the lack of LED illumination, but be quiet! 's decision not to go gaudy is fine by me. Those who appreciate a good heatsink will recognise this as a beautiful piece of kit, albeit one that feels eerily familiar. 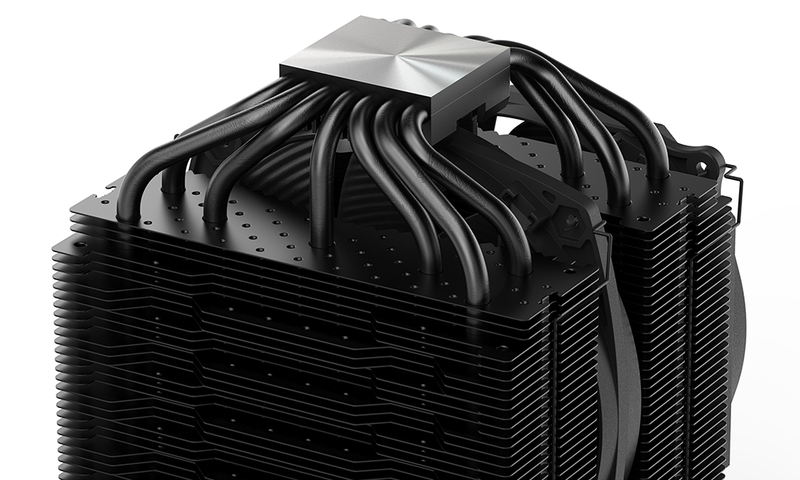 Dimensions of 163mm (L) x 136mm x (W) 146mm (H) are almost identical to Dark Rock Pro 3, and the cooler retains a dual-tower form factor with seven black-coated copper heatpipes and two bundled fans. The front fan is a 120mm PWM blower and squeezed into the middle is a slightly slimmer 135mm unit. Both come from the highly regarded SilentWings stable, feature a six-pole motor and attach to a single four-pin motherboard header via a provided splitter cable. 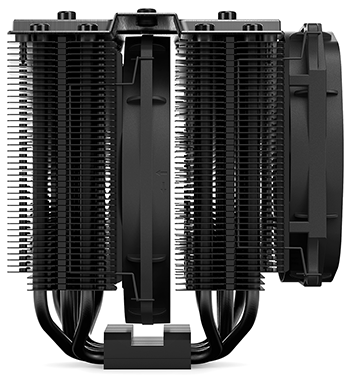 A 250W cooling capacity seems to suggest that Dark Rock Pro 4 and Pro 3 are one and the same - they even share a wave-shaped and dotted-fin design that is said to improve efficiency - but there is one very important change. Anyone who experienced the outgoing model will attest to the fact that it wasn't fun to install. Thankfully, Pro 4 finally makes the switch to a top-mounted installation mechanism, meaning no more bolts nor hexagonal spanners. Taking a logical approach to installation, be quiet! 's revamped mounting kit supports every expected Intel and AMD socket except for Threadripper. 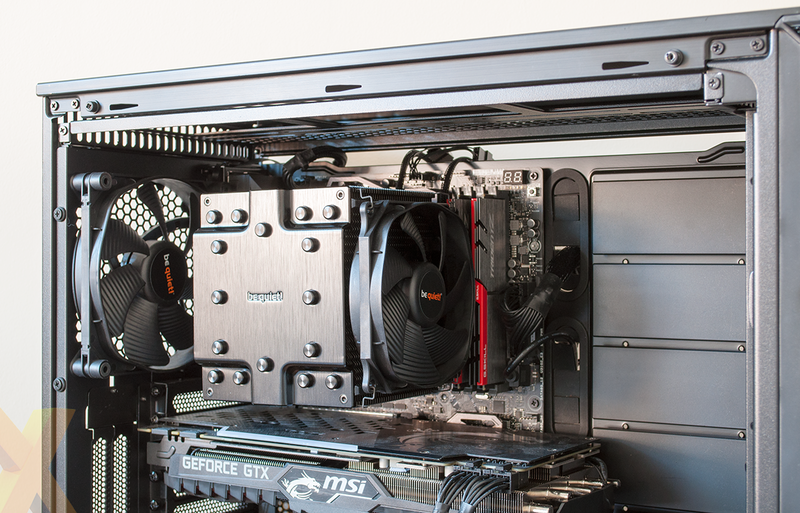 Adopting a tried-and-trusted combination of kit, getting the rather large heatsink in place is as simple as fixing mounting brackets to a backplate and then securing the cooler using a metal bridge that also happens to be finished in black. The bridge requires two screws to be fastened, and in order to make them easy to get to, the two central caps on top of the aluminium lid are unscrewed to leave a direct path. It's still a long way to reach, but be quiet! does the right thing by including a suitably sized screwdriver in the box. 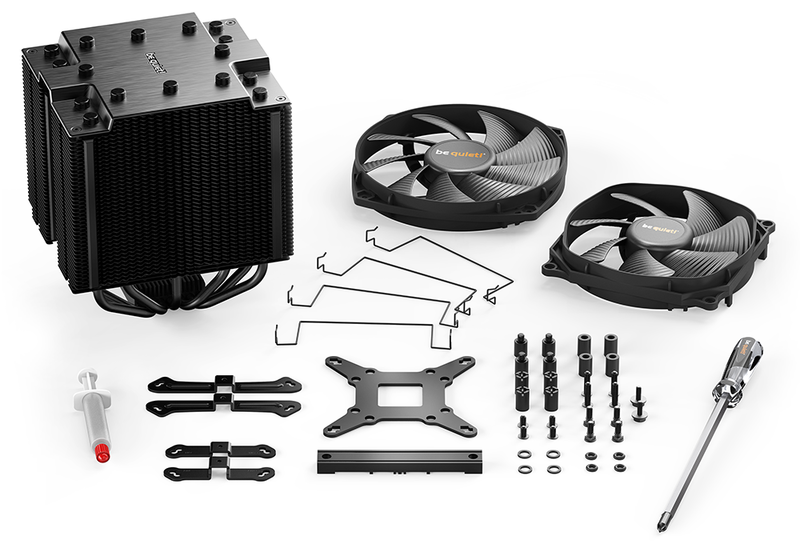 All of the items in the bundle are well packaged in separate bags for Intel and AMD boards, the instruction manuals are clear, the whole kit is backed by a three-year warranty, and we like the fact that a spare set of fan mounting clips are included for anyone wanting to attach a third fan to the back of the cooler. Installation has improved dramatically, though we're of the opinion Noctua still holds a slight advantage in terms of ease of use and bundled kit. Two slight niggles with Dark Rock Pro 4 include the fan-mount clips, which look tidy but don't feature the usual flap on the longest side, making them somewhat tricky to remove, and while we're in the mood for nitpicking, the bundled 0.5g tube of thermal paste feels miserly at this price point. 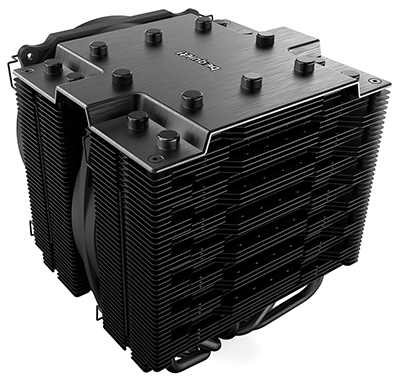 Another question-mark that inevitably crops up is whether high-end users ought to choose air or liquid coolers. Opinions are divided and there are pros and cons on both sides of the fence. 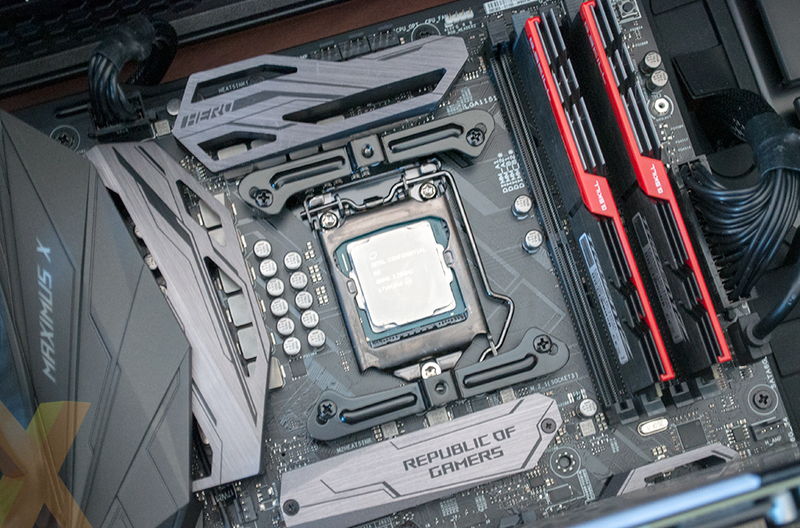 Though Dark Rock Pro 4 is a good-looking piece of kit, it's still a large item and conceals most of the area around the CPU socket - on an Asus ROG Maximus X Hero motherboard, we were forced to raise the cooler's front fan a few millimetres in order to get sufficient clearance for our G.Skill Trident Z memory modules. 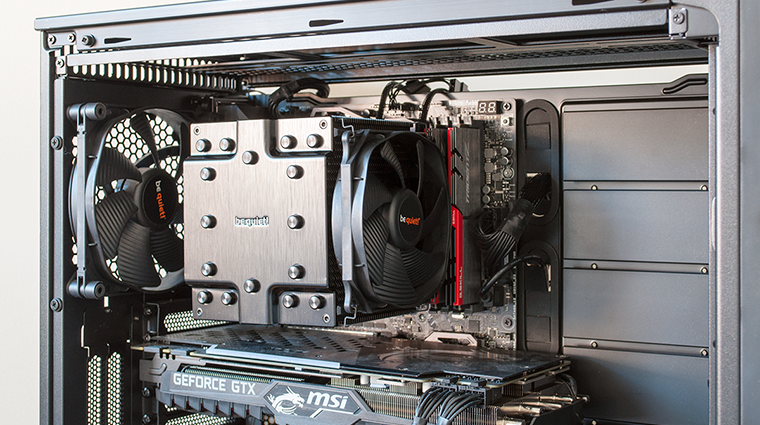 A liquid cooler can appear tidier, but there are noise considerations, too. 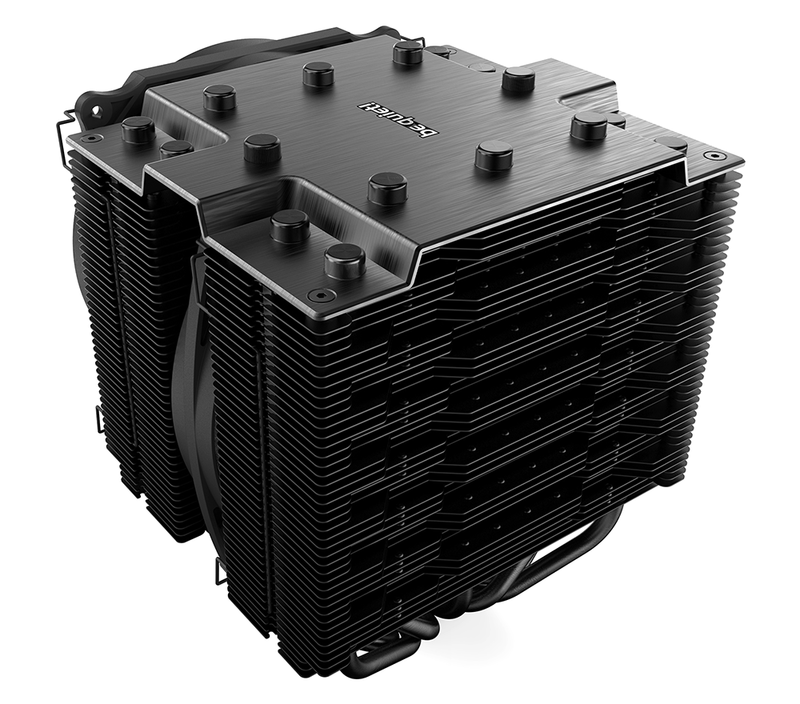 Despite improvements in the latest pumps, an air cooler, in our experience, is typically the quieter option, particularly when idle, and though we've never had a liquid cooler fail on us, air can also be deemed the less risky of the two. There's no clear-cut choice, but having tested a fair few premium liquid coolers on our brand-new Core i7-8700K test platform, let's now see how the Dark Base Pro 4 compares.